Earn $0.87 in VIP credit. Click to Learn More. 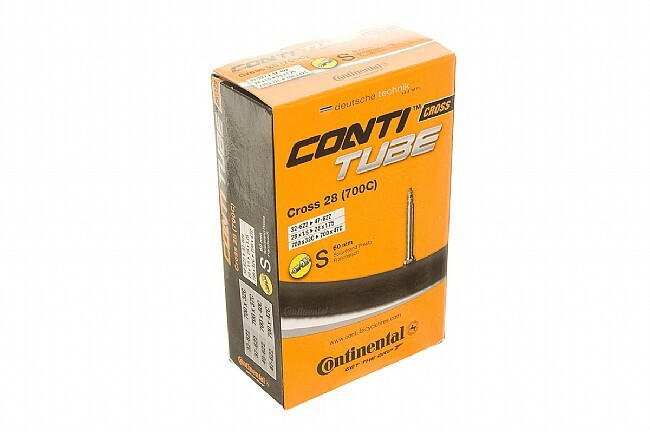 Continental's CX Tubes are light, durable and reliable. Great for cyclocross, of course, as well as other applications. They're made from standard weight butyl and feature removable Presta valve cores. Available in 700c x 32-42mm size (32/42-622 ISO) with a 42mm or 60mm Presta valve. Average weight: 165 grams. This tube works great for cross or adventure bikes with wide tires 32-42 mm. The tube is supple enough but it also thicker rubber than a road tube as it should be. I have been running these on 2 cross bikes and have not had any issues. 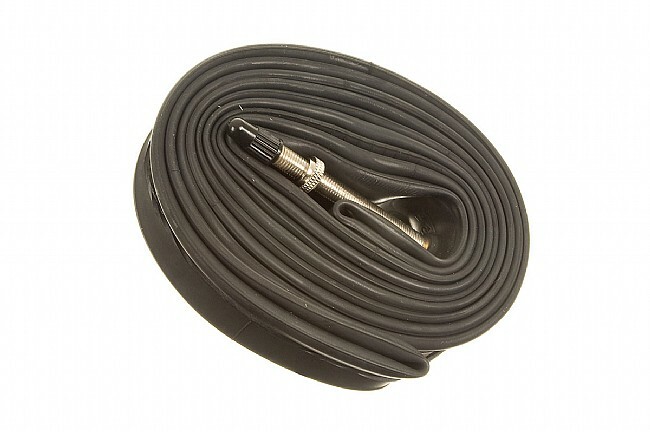 It's difficult to get too excited about a bike tube but this tube is nicely constructed and has an extended threaded stem. It works perfectly with my fatty Gatorskins and I'm pretty confident the only time I'll see them again is when my tires wear out. They've been pumped up in those brand new Contis for about a month now. Seem to be holding air great! the tube itself is a little on the heavy side but considering I make it heavier by squirting an oz of stans in it i feel i shouldn't complain. being able to remove the valve core and add sealant was the my whole reason for getting this tube and it has held up well. no flats yet and that with running through a goat head patch. I'm usually not a Conti guy, but I use these on my CXcommuter and am pleased. Strong, nice roll, seems like minimal air loss compared to others. Is there any warranty on these? 10 bucks is not cheap. The tube developed leak at the seam several miles into new ride. Checked the item, it has a leak at the seam where the radial and axial seams meet. Even though I realize that problems happen, this seems to be a design issue and might happen fairly often. I used the tune less than an hour. Is there any type of warranty? This is disappointing. I might go back to my old Tufo's. Using these on my daily driver to commute. Only flat has been on a huge patch of glass that no tire/tube would've made it through. Gets beat up, but has held up well for me. Knock on wood. They aren't light, but they are durable! I use them on my cross bike for winter training and on local trails. They aren't super light, but you don't really want thin tubes when they are designed to take abuse. Conti generally makes tough products, if not always the lightest. This tube follows in that mold, as it's thicker than a regular tube, but I've also been able to get away with considerable abuse, running as low as 25 psi on some courses without damage. Just OK. I'd save your $$ for something better/lighter, or just buy cheap tubes and put your money into your wheels where it matters. No issues after a season of running these tubes. Not one flat and I'm running my cross tires around 50psi off road. They have taken hard hits and keep on trucking. These are thick and very well made ... the quality shows. I got these specifically for the removable valve core so I can add Stan's sealant. So far they have worked very well for cyclocross racing - no flats from thornsgoatheads or pinch flats. The advantage of the removable valve cores to add sealant provides added protection that's worth the extra cost. Bought these for Back up tubes in case of a flat on my tubless set up for DK200 and fortunately didn't need to use them. I've run these before on gravel though without issues so thought they would be a great choice. I like these tubes because I can keep just one size due to their versatility for my non-Road bike usage. I can use these with my commuter 700c x 32mm tires as well as with my 700c x 35mm-36mm GravelAdventure type tires. The 60mm Presta valve provides convenience when used with mildly aero rims where the 42mm valve length makes accessibility tight on some wheels. I purchased these because 60mm Presta valve for CX tires are difficult to find in other brands. They performed fine, but were a little heavy. I did pinch one of them, but that was my fault, not the tube.